There are now two upcoming Star Trek movie events. 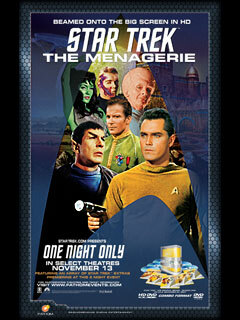 Slice of SciFi reports that the two-part Star Trek Remastered version of “The Menagerie” will be presented in selected theaters on November 13 to promote the HD-DVD release the following week. The screening will include an introduction by Eugene Roddenberry, son of Gene Roddenberry, and a behind the scenes look at the making of the remastered Star Trek series. Last week the Committee on Small Body Nomenclature of the International Astronomical Union approved the name “7307 Takei” for the asteroid previously labeled “1994 GT9.” The Takei reference will be used in the scientific community to identify this minor body from now on, presumably forever. Only about 14,000 asteroids have been named after specific people, out of about 400,000 such bodies known to exist. There’s rumors of upcoming movies. Cinematical speculates that Joss Whedon might make a sequel to Serenity. The Guardian says the BBC is considering a movie version of Doctor Who. SciFi Wire reports on rumors that Billie Piper might return for the movie or a three part special. The season finale airs tonight for those watching Doctor Who on the SciFi Channel. My review was posted here. The special two-hour episode “Razor”, which will serve as a backdrop for the events of season four of Battlestar Galactica, tells the story of Lee Adama’s first mission as the commander of the battlestar Pegasus — and the harrowing tale of that ship’s desperate fight for survival in the immediate aftermath of the Cylon’s genocidal siege of the Twelve Colonies. Lee Adama’s new XO, Major Kendra Shaw, is plagued by memories of her service and sacrifices under Admiral Helena Cain, who was able to save her ship during the Cylon attack — but only by making Shaw and her fellow officers rationalize suicidal battle tactics and brutal war crimes against their own people. In the crucible of war, Shaw must let her hesitation and doubts burn away, until all that remains of her is the honed edge of a living human weapon — what Colonial veterans call “a razor.” But an edge so fine cuts in more than one direction. It can cleave an enemy to pieces … or it can carve away a person’s soul. The Razor Flashbacks From October 5 through November 16, SCI FI whets Battlestar fans’ appetites every Friday night with Razor Flashbacks during all-new episodes of Flash Gordon. 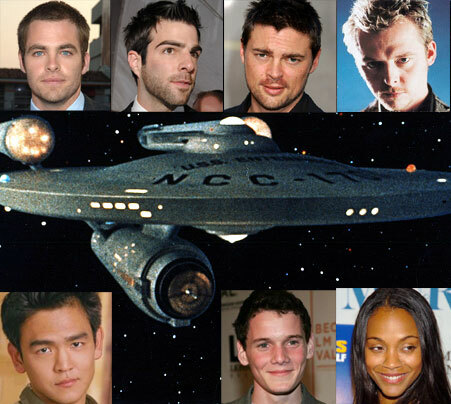 All the flashback clips will be available on SCIFI.COM immediately after broadcast. Written by Michael Taylor and directed by Wayne Rose and Felix Alcala, these intense, roughly two-minute segments tell the story of young William “Husker” Adama’s rookie Viper mission during the first Cylon war. In addition to fighting for his very survival against relentless Cylon centurions, Adama makes a terrifying discovery that will come back 40 years later to threaten him, the crew of the Pegasus and the survival of the human race. This isn’t footage you’ll see in the premiere of Razor, so make sure to watch every Friday for a new flashback adventure, then see it again on SCIFI.COM! The premise of another show being considered normally might not excite me but, considering that it is being produced by J. J. Abrams and written by Jill Soloway of Six Feet Under, it is worth checking out. The show “centers on a mobile notary who involves herself in the lives of those with whom she comes in contact.” Who would have guessed that a show about a family who runs a funeral parlor would have turned out to be one of the best shows ever to appear on television?